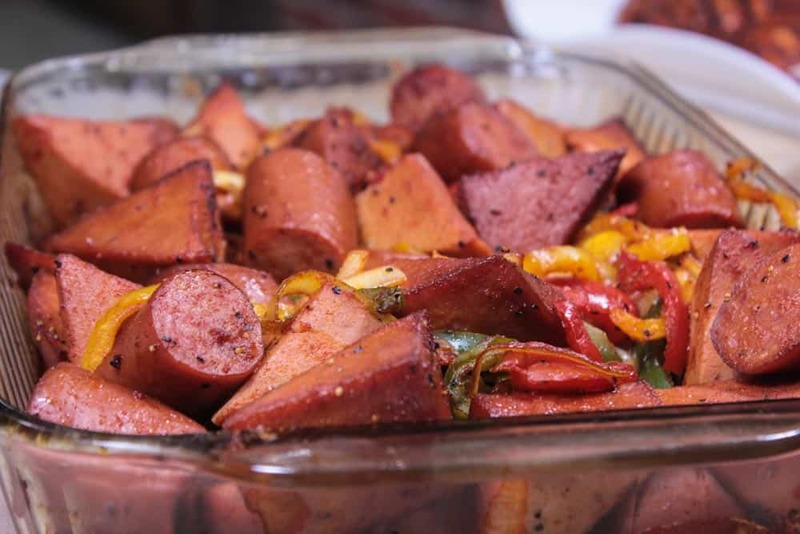 Smoked sausage and peppers is always a great combination. 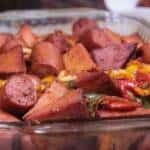 If you are feeling adventurous try it Oklahoma style and add some chunks of bologna as well. 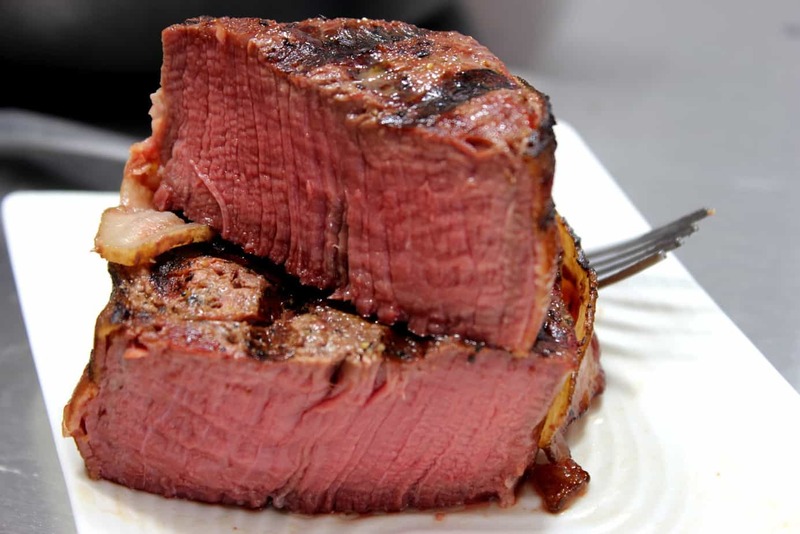 Many folks may already do something like this on the grill or even in the skillet but using Jeff's original rub (purchase recipes here) for the seasoning and cooking it in the smoker for a couple of hours will really kick up the flavor. 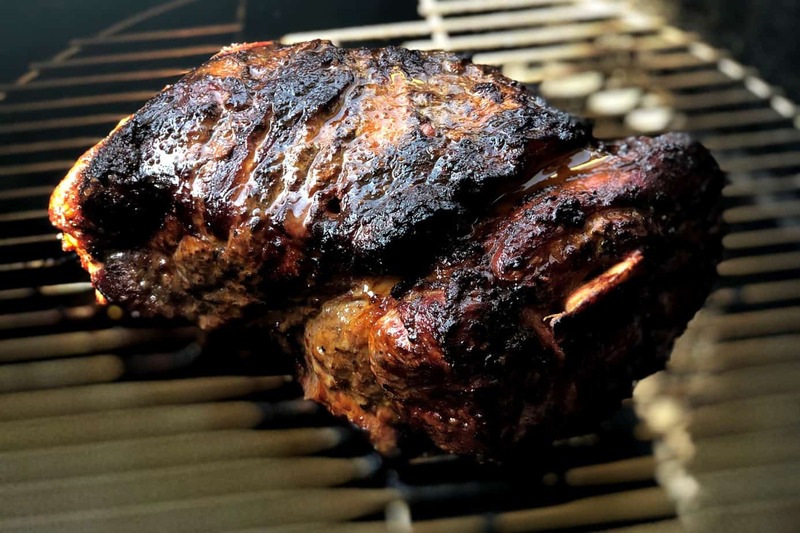 Use Jeff's original rub (Jeff's Naked Rib Rub) liberally on this dish to seriously “kick up” the flavor and make this a dish that you do time and time again. 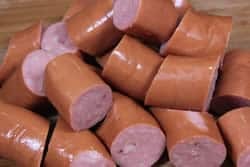 If you are doing sausage with bologna, you will want to have about 4 sausage links and about 2 lbs of bologna. If using sausage only, you'll want to use an extra 3-4 links. 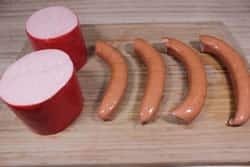 Cut the sausage up into pieces that are about 1-2 inches long. 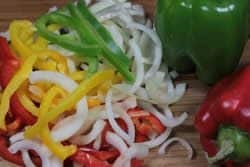 Remove the stem, core and seeds from the peppers and slice them up into strips as shown. Slice the onion into pieces. I went ahead and put everything in the bowl to make sure it was going to fit properly. 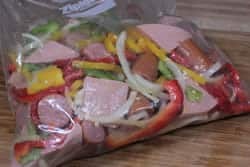 Place the bag into the fridge overnight if possible to let all of the flavors meld together or at least for a couple of hours. 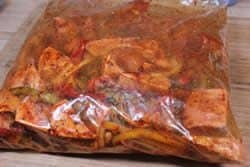 When the marinating is finished, pour the contents back into the 9×13 or whatever container you are using. 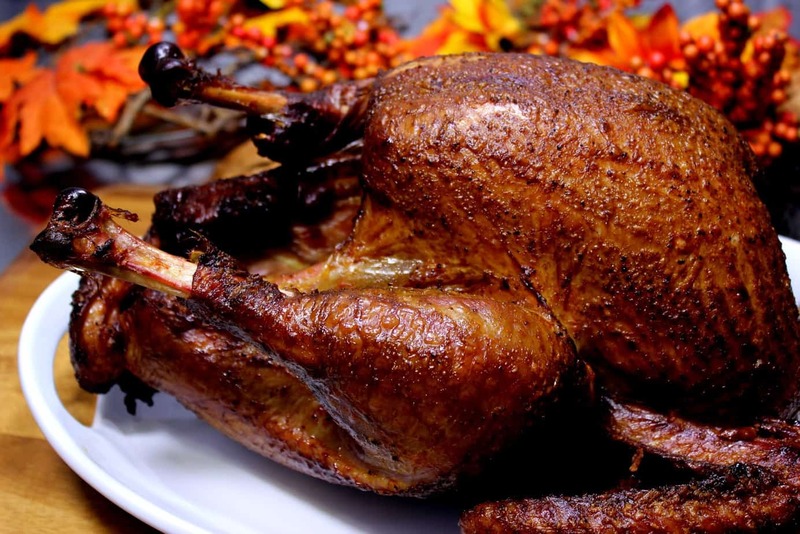 Set up your smoker for indirect cooking at about 225°F for 2 hours or until the vegetables are sufficiently tender to your liking. 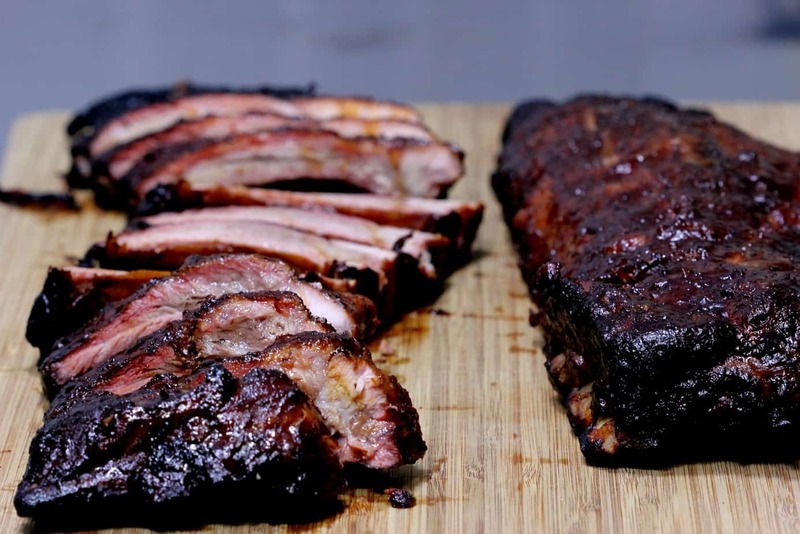 Apply smoke from cherry, apple or your favorite smoking wood for at least 1 hour or you can keep it going for the full 2 hours for great flavor. Stir the meat and vegetables 3-4 times during the process to make sure the smoke has access to everything. When the vegetables are tender to your liking and the meat has had time to get sufficiently hot and smokey, the dish is complete. Serve over rice or on top of buns and enjoy! 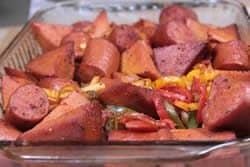 Smoked sausage and peppers is always a great combination. 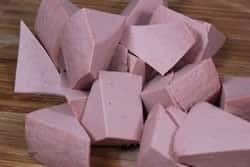 If you are feeling adventurous try it Oklahoma style and add some chunks of bologna as well. 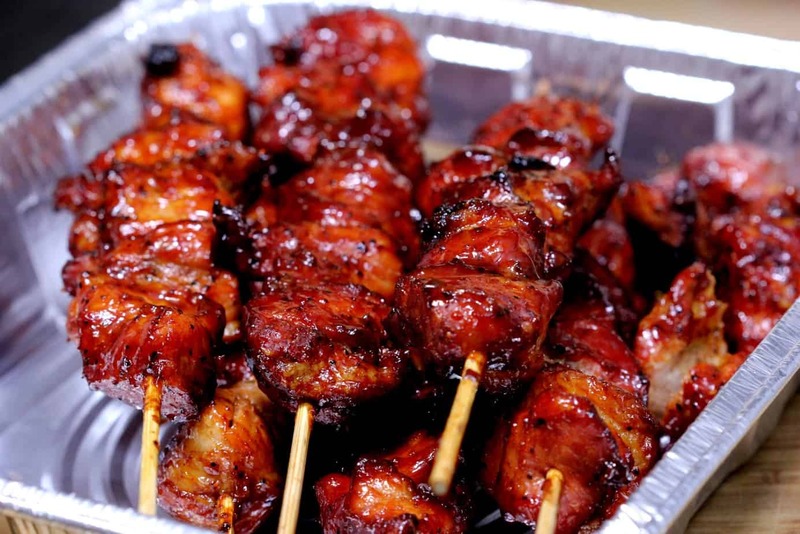 When the marinating is finished, pour the contents into a 9x13 or whatever container you are using. 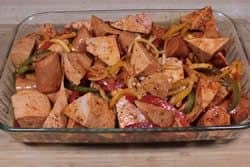 Love the recipe but for some reason the peppers come out bitter. I’ve made it twice and making again this week but removing the peppers. BTW I use an electric smoker. 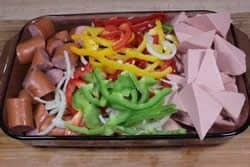 Jeff, after I made this and brought it into the house it was gone in 10mins My friends and family could not believe that I used bologna they all rated your dish a 10 star dinner. Thanks for the home run again!!!!…. 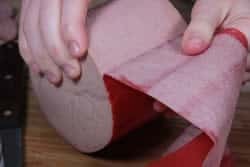 I highly recommend not omitting the bologna – nothing better! Great recipe Jeff!